I plan to, with GOD'S Help ,to turn The Winter of my Life into an endless beatuiful Spring Day ! Byker Wyker & SAILCAT will ride again, with a little help from our friends and The Good Lord ! Are you aware that there is a saltwater fish called SAILCAT and The bones are in the shape of a Crusifix.With The Roman Sword in CHRIST'S side ,and when you shake the skelaton of The SAILCAT you can hear The Dice rattle ,like The Roman Soidlers gamblin' for Christ's Robes ! The way I see it ,there is just too much about this whole THANG to be a mere coincedence ! And of course I do need help in a lot of areas...I look forward to workin' with you Brother BO ! THANKS Robert "Ca$h" Register ! I love your mailin' elists and the thangs you do and the thangs you post ! Hope to see you soon my Brother ! In the late 1950s, Alabama and Florida considered sharing the cost of a bridge across Perdido Pass at Orange Beach. That span would link the two states. The assumption was that the state line ran down the channel, so one side belonged to Alabama and one side belonged to Florida. But when the survey was made, it was discovered that the pass had shifted west over the years — but the state line, which was based on a scientific survey, remained to the east. In other words, Alabama had picked up about a mile or so of prime beachfront real estate. It also had to pick up the tab for the bridge, since both sides were in Alabama. See? State lines are important. That’s why we’re watching the work of Milton Denny, a surveyor who works with Auburn University. He’s trying to locate the low, man-made mounds that were created to mark the north/south boundary of Alabama and Florida, a recent story in the Tuscaloosa News explained. What Denny finds will not change the border. It is set at 31 degrees latitude; there it will remain. It may make a difference in local land lines, which were based on the original survey that the mounds marked, but even that is unlikely. What it will do is help Alabama historians locate and identify the physical remains of the Ellicott Line, the survey conducted by Andrew Ellicott in the 18th century to determine the boundary between the United States and Spanish Florida. To mark the line, Ellicott placed a large stone near the Mobile River and then constructed mounds every mile — 120 in all. Of these, the whereabouts of only two were known until recently. Using modern technology such as Google Earth, Global Information System and Global Positioning System, Denny devised a formula to find the others. Thus far, he has found a few — 24 at last count, with 10 more possible locations yet to be checked out. Alas, there are swamps to navigate, landowners who do not want surveyors on their property, and locations that have been so disturbed that the mounds no longer exist. When done, Denny expects to find as many as 35 to 40. Although the research promises to enhance the scientific knowledge about our state, it also is a practical exercise for training and certifying field surveyors. That’s a benefit for those interested in state history, and a benefit for the state, as well. I got some real good news today. My book agent, Sterling Lord, called to tell me he sold my Vietnam novel. You can say I had a big grin on. Overlook Press, a small publishing house in New York, bought it. Next will be the contract signing, then I'll iron out any wrinkles they want smoothed, before the printing. No idea how long it will all take. 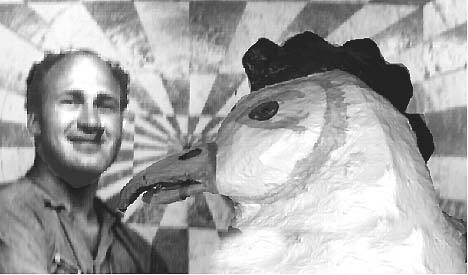 Why did the chicken go to the psychic? Chicken sees another chicken on the other side. Says, how do I get to the other side? You are already on the other side. 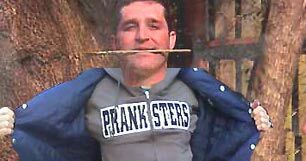 We are all invited to become a prankster and represent the one and the sacred word of jokehood, the HOLY GOOF. Embrace the Lost Creek organic struggle by wearing and sharing and paying less attention to what is distracting us from what's real. Recorded at Cloverland Studio, Montgomery, Alabama and released on Morgan Records in the Fall 1965. *This was the first song we ever wrote as a band, and the first song we ever played together! There was a recording session in early 1967 at Fame Studios in Muscle Shoals, Alabama. No songs were released from this session, as it was cut short by an emergency due to the heart attack of the father of our horn player Ronny Monroe. However one song rehearsed was The Great Pretender, a cover of the Platters version. Dan Penn produced and engineered the session, and encouraged us to record this song he had, called The Letter. Unfortunately, we didn’t. On 22 August, 1967, we recorded four songs at Cosmos Studios in New Orleans, Louisiana, produced by Marshall Seahorn and Allen Toussaint. The songs were Shake Sherry Shake, a cover version originally recorded by the Contours, It’s a Wonder, Soothe My Soul, and Get Out My Life Woman, a cover version originally recorded by Lee Dorsey. These songs were never released, and the band later forfeited all rights to the songs (5/68) in order to sign a recording contract with Bob Hinkle and Warner Brothers/Reprise records in Los Angeles, California. The Train, and Heartbeat were recorded in June 1968 at Fame Studios in Muscle Shoals, Alabama and engineered by Jimmy Johnson. These were the demos recorded as the band Heart, with Johnny Townsend on vocals. They were later released on Warner 7/Reprise records. I just read the article on Buddy by Anastasia Harbuck. Enjoyed it very much. I hope I can come to bama for his induction but it's looking like I might be working. Tell Buddy hey from me and give him a big ol' kiss. I just love that man. I'm enclosing a pic of me and my daddy at the first Rock-and-Roll Hall of Fame induction in New York at the Waldorf Astoria. My daddy was one of the first ten inducted along with Roy Orbison. It was an amazing night. Awesome on you and Ellicott's Line, RR. Sometimes folks have to circle back and step twice or more on truth before before they can see it, feel it and smell it, the contemporary human condition, I guess. Or just stuck and can't get off top dead center. Thx. Words cannot express the satisfaction of writing an article fifteen years ago and seeing it have impact on research in 2010. That's what's happened with the Andrew Ellicott article I wrote that was finally published in the May '97 issue of the Gulf Coast Historical Review. The survey of Ellicott's Line from 1796 to 1800 is the basis for all Wiregrass history. Hopefully... eventually, everybody's gonna understand that.